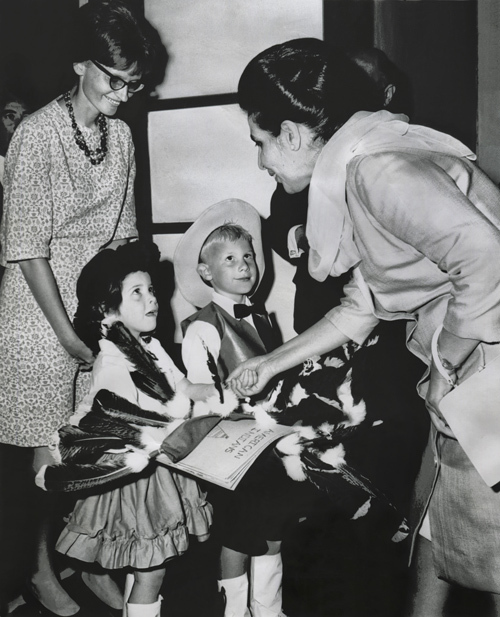 In Small Things Remembered » American children present gifts to Queen Homeira at the 1968 Jeshyn Fair. Queen Homeira at the 1968 Jeshyn Fair. More than 50 American school children performed a “Cowboy and Indian” act to highlight American culture for 6,000 Afghans in Ghazi Stadium. The show lasted only 15 minutes, but that was long enough to win the heart of Her Majesty the Queen. The children presented her with a Native American headdress and a book about American Indians, both of which they had made. Courtesy of Ambassador and Mrs. Bruce Laingen.